R is for using a Routine. The first thing you should do even before coming to Thailand is to develop a set a pre-shot routine for use on your trip. You can do this from the comfort of your home or on the golf courses nearby in Europe or the USA. Then when you arrive for your Thailand golf vacation, and from the first tee at Blue Canyon or even Amata Springs, you will have much more confidence, consistency and ultimately enjoyment from your golf holiday. It’s so simple to do, not requiring any physical abilities or special golf movements, yet so many golfers I see on vacation in Thailand neglect to incorporate this into their game. Following a simple routine helps you be more consistent on each shot, gets your thoughts away from too many mechanical ideas, and makes it easier for you to hit a shot when you are playing an unfamiliar golf resort. If you look at the golf professionals, you will see they do the same things prior to every single shot. For most resort golfers, this seems too easy to be true. Your routine does not have to be the same as the professionals, in fact it is better if you make your own, but make sure you go through your routine before every single shot on your Thailand golf trip. Here is what my routine involves. First I inspect my lie. Is my ball in the rough again? Most of the times it is! Then I check with my Thai caddie to get the yardage to center of the green. I do not rely on my caddie to calculate distance to the pin as most times this seems to be too much to ask. Then I select my club. Here is where my strict set routine begins in earnest. From behind the ball I grip the club with my left hand. From there I take a practice swing behind the ball. Then I address the ball, put my right hand on the club, pick out my intermediate target, and I pull the trigger. My entire routine takes about 6 seconds. I like to get the shot over with and do not spend too much time over the ball as I find things actually get worse the longer I stand there! Your routine can be longer, just make sure it’s repeatable and you practice it. That’s right; practice it, until it becomes second nature. 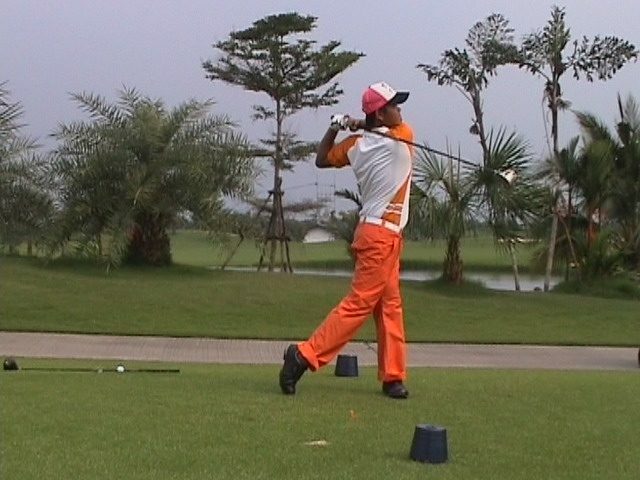 Thai golfers always want to be more consistent, and this is the easiest way to do so, barring a major swing change or series of professional golf lessons, which most holidaymakers are not prepared to do. It may take you a little while to get used to doing this on every Thailand golf shot, but I guarantee that you will more consistent if you incorporate a routine every time you teed it up. A pre-shot routine is practically the only on course action that anyone can take to insure good scores and maximum enjoyment from every Thailand golf vacation!